Are you looking for a delicious rice recipe with a difference? If you are, you’ve found it! 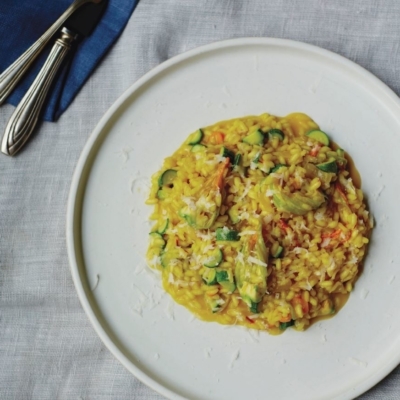 Here’s my courgette & saffron risotto for you to enjoy. Saffron, sometimes referred to as ‘red gold’ because of its deep ruby-red colour, flourishes in the fertile hills of Sardinia’s Medio Campinado province in southwestern Sardinia. The locals use it liberally in their cooking, but given its high price in Britain I tend to use it sparingly and in dishes where it will be one of the star attractions such as this delicately-flavoured risotto. The courgette flowers add colour and flavour, but they aren’t essential. Feast your eyes on the finest courgette & saffron risotto! It’s straightforward and fun to make this great dish. Simply follow the instructions below and get the perfect result. Put the saffron in a small bowl, add 4 tablespoons of the stock and set aside. Heat the oil in a large, heavy-based saucepan over a medium heat. Add the onion and fry gently for 5 minutes, stirring, until softened but not browned. Add the rice and stir constantly for 2 minutes or until the grains are coated and shiny. Pour over the wine and simmer for about 1 minute until it has evaporated. Stir in the saffron mixture. Add 2 ladlesful of the remaining stock, bring to a simmer and stir until all the stock is absorbed. Continue adding the stock in the same way, stirring and waiting for it to be absorbed before adding more. After about 6 minutes, add the courgettes and the courgette flowers (if using) the continue with the stirring and adding of the remaining stock for a further 8-10 minutes or until the rice is cooked but still has a slight bite. You may not need to use all the stock. Remove the pan from the heat and add the butter and Pecorino, stirring for about 30 seconds until creamy. Season with some salt and pepper and serve immediately. 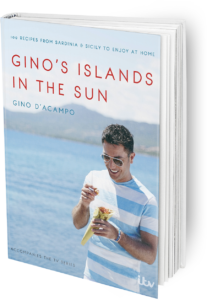 Once you’re done, simply sit back and enjoy your courgette & saffron risotto and don’t forget to check out other great authentic Italian recipes including great antipasti recipes, Italian pasta recipes, Italian soup recipes, Italian beef dishes and authentic pizza recipes.